Elegant braid motifs grace the finger in this band ring from Bali handcrafted of sterling silver by local artisans. Featuring a combination of finishes for a striking look, this beautiful ring is presented by Komang Wijayana. The ring is named after Celuk, a town well-known for its silversmithing. 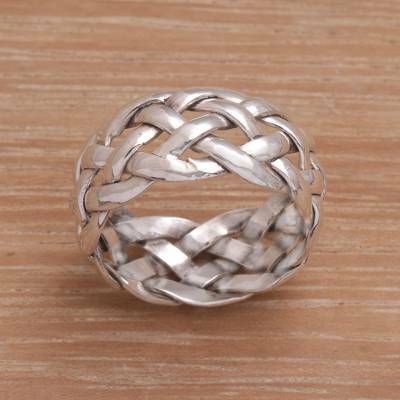 You can find sterling silver band ring 'Celuk Braid' by Komang Wijayana in jewelry categories such as No Stone Rings, Silver Rings, Sterling Silver Rings and Band Rings. Enjoy exploring these sections for other Novica treasures. "This is now my cherished hierloom." This is a beautiful ring. It fits great and design of the the ring is fantastic.